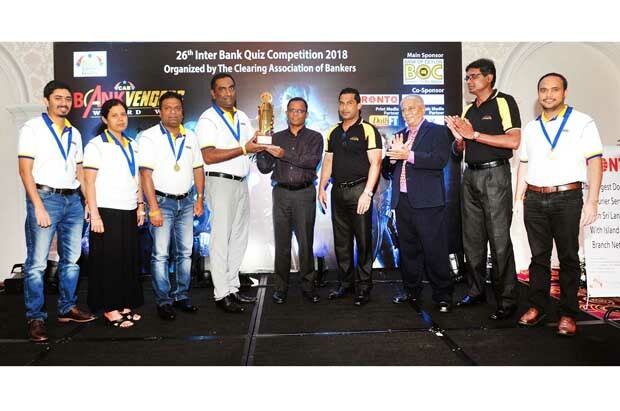 The 26th Annual Interbank Quiz Competition organized by the Clearing Association of Bankers (CAB) was held recently at the Balmoral Hall of the Kingsbury in Colombo. The Hatton National Bank – A Team emerged victorious once again, outshining 29 teams representing several commercial, development and savings banks in the country. People’s Bank – D Team was placed second with the B Team of Sampath Bank coming a close third. The Interbank Quiz is organized annually by the Clearing Association of Bankers with the objective of fostering the rapport among bankers, encouraging interbank fellowship and imparting knowledge on varied subjects such as current affairs, law in relation to banking and finance, international trade, sports, entertainment, etc. The main sponsors of the Quiz this year were Bank of Ceylon and Pronto Lanka (Pvt) Ltd, with Transnational BPM Lanka (Pvt) Ltd as co-sponsor. The Clearing Association of Bankers (CAB) is an association formed by the staff of the cheque clearing departments of all commercial banks in Sri Lanka, the National Clearing House, Lanka Clear (Pvt) Ltd and the Central Bank of Sri Lanka. CAB was formed with the objective of enhancing the knowledge of bankers as well as to promote goodwill, understanding and fellowship among professionals engaged in clearing and to acquire cutting edge technology in the world with regard to Clearing for member banks. The association has been able to fulfill these objectives with many activities performed island wide with a large participation. CAB currently constitutes more than 450 life members from the banking fraternity and the incumbent President is Mr. M. Razak Deen from MCB Bank. The Association has been striving hard to make the Quiz program popular and the most sought after annual event of the banking fraternity.